In 1977 George Lucas introduced the world to the droid R2-D2, an “astromech droid” that was a major character in a six of the Star Wars films and which has become entrenched in Western popular culture. Not bad at all for a character no no real dialog to speak of. That is a feat normally only achieved by action stars and hot babes willing to strip down for the camera. Of course, fans being fans, they couldn’t leave well enough alone. It was a foregone conclusion that they would come up – quite outside of canon – a product-improved model of this particular droid. 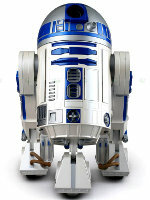 Hence we now have the R2-DCUP. Note to fanboys – If it took you under 1 minute to “notice” that the 6 horizontal bars on the girl’s outfit are on the wrong side, you’re both wrong – mirror effect – and in need of serious help. If it took you under 1 minute to “notice” that the 6 horizontal bars on the girl’s outfit are on the wrong side and to correct your thinking because you realized the mirror effect, you’re likely beyond help, will never move out of your parents’ house, and will never be in a position to directly appreciate a Geek Grrl like the one pictured above. Seriously though, she’s quite hot but Star Wars fetish lingerie? R2-D2!?! That’s just a little messed up and I don’t even want to delve too deeply into the implications of choosing a character that couldn’t speak. This entry was posted on Saturday, January 22nd, 2011 at 10:30 am and is filed under Humor, Society. You can leave a response, or trackback from your own site.